That bright blue boost button is sitting right there next to your latest post, that so far isn’t getting any traction… it’s so tempting to just hit it, add a few quid and cross your fingers for some engagement. But it’s likely that you’ll be wasting your money if you do. Step away from the boost button… at least until you understand when you should be using it. So you’ve shared a post on your business page, it’s not had any engagement at all…. just silence… it’s like you’re talking to yourself. 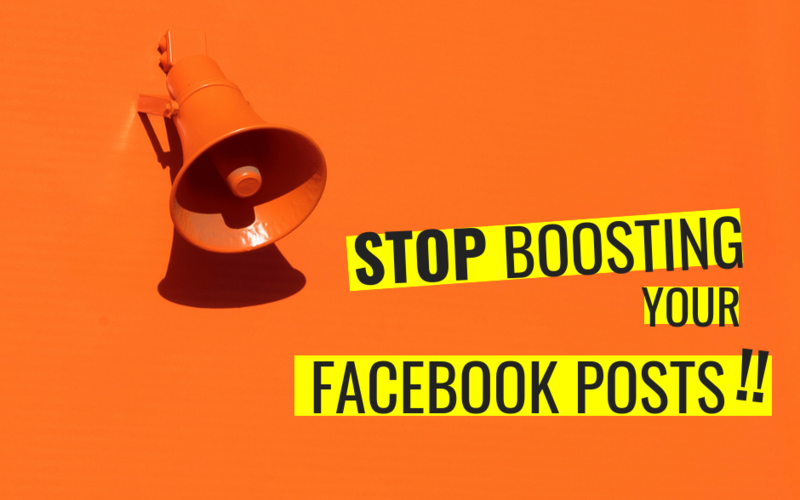 If your post is getting no engagement organically, the chances are it won’t get much by hitting boost either. So to give yourself (and your money) the best chances of success, take a look at your post first. Does it invite engagement? Are you asking a question? Giving your followers a call to action? Or are you just broadcasting? If no one cares about your post, boosting it simply means you’ll be spending money to show it to more people who don’t care! Write engaging posts that people can reply to easily. Once you start to get some organic engagement on your post, in the form of reactions or comments, it might be time to consider the boost button. But first, ask yourself why do you want more engagement on this post? Is it because it will really benefit your business? Or is it just for vanity reasons? If it will benefit your business, because the post is informative, has a good call to action or a link to your website then maybe that boost button might be an option. If it’s for vanity reasons and you simply want more likes and comments then that’s fine too. Either way before you hit boost you need to know what your objective is and whether you might be better off spending your money on an advert. Decide whether to boost or create an ad. To do this you need to understand what your goal is so you can choose the right objective either on your boost or within ads manager. 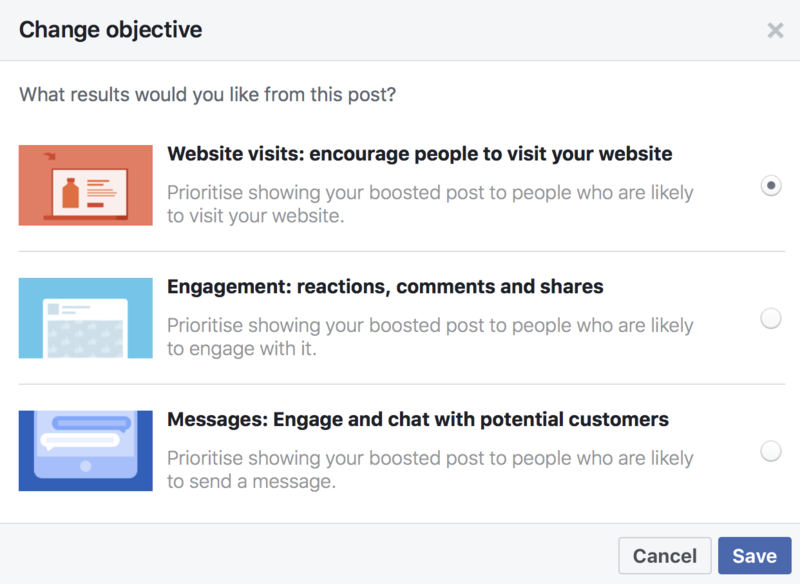 If you want more engagement (reactions, comments, shares) on this specific post then you can choose to boost and pick the engagement objective. Or if you are used to using ads manager you can create an engagement campaign and use this post as the creative or create a whole new (engaging) post. If you want people to contact you, perhaps to make a booking or ask for more details then you can choose boost and pick the message objective. Again, if you are used to using ads manager you can create a messenger campaign and use this post or create a whole new ad. What do you want them to do when they get there? If you want them to simply visit the website to read a blog or view a product page then you can choose to boost. But if you want them to take an action when they get there, like buy something or sign up to your email list, then it’s likely boosting isn’t the right way to go. Creating an ad with a traffic or conversions objective is likely to get you better results. Why create an ad instead of a boost? So now you know what you can do with a boosted post, you might be wondering why you should bother doing anything else. So it is important to understand that using ads manager to create paid campaigns will give you more bang for your buck. You’ll get a bigger choice of campaign objectives, so you can optimise for conversions, lead gen etc. Ads manager gives you many more options on how your post can look in the newsfeed and you can include headlines and choose different CTA buttons so you are more likely to get the result you want. You also get more targeting options in ads manager as you can create custom or look a like audiences as well as interest based audiences which you can save for future campaigns. Plus ads manager gives you better reporting so you can understand exactly why your money isn’t giving you the results you want and can tweak your campaign accordingly. Of course, none of this means you should never use the boost button, it simply means you should consider it for longer than 5 seconds & do whatever will work for your specific goals. Still unsure about whether to boost or create an advert? Or need more advice on how to make your marketing budget work better on Facebook? I can help, find details on how I work here.